2018's Best Embroidery Machine: Which Will Be Our Next Top Model? Home Best Of 2018’s Best Embroidery Machine: Which Will Be Our Next Top Model? 2018’s Best Embroidery Machine: Which Will Be Our Next Top Model? Do you need an embroidery machine? If you're thinking about adding decorative machine stitching to your quiver of skills, you might just. An embroidery machine is not your great-grandmother's foot-powered Singer. Today's embroidery machines are technological marvels with interfaces that sometimes look like the control panel of a space shuttle. And the price tag of some models can be enough to make anyone think twice. Fortunately, there's a wide range of embroidery machines on the market today. 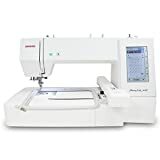 You can find entry-level models that won't set you back too much, and models that double as sewing machines, in case you end up not using the embroidery function as much as you thought you would. And if you're serious about machine embroidery, some near-professional quality higher-end models could even help you launch your own business. Which one is the best embroidery machine for you? Have a look at our roundup of today's best models and see. Embroidery machines are a subset of sewing machines. Specifically, they're a special sewing machine that does embroidery. Some do only embroidery, while others also have regular sewing capabilities. Some come pre-loaded with stitches, for example, alphanumeric fonts for monogramming. Others may have extensive libraries of patterns. Still, others may allow you to build your pattern library by uploading the patterns of your choice to your machine and even edit them right on the machine. However, they all have specific features that you should consider. When making any big purchase, you have to consider the decision carefully. With an embroidery machine, there are several questions all potential buyers should ask themselves. 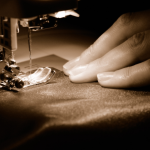 There is a significant difference between a home embroidery machine and a commercial one. And this difference comes down to more than price. If you're looking for equipment to start a business, or to expand one, you need a commercial machine. 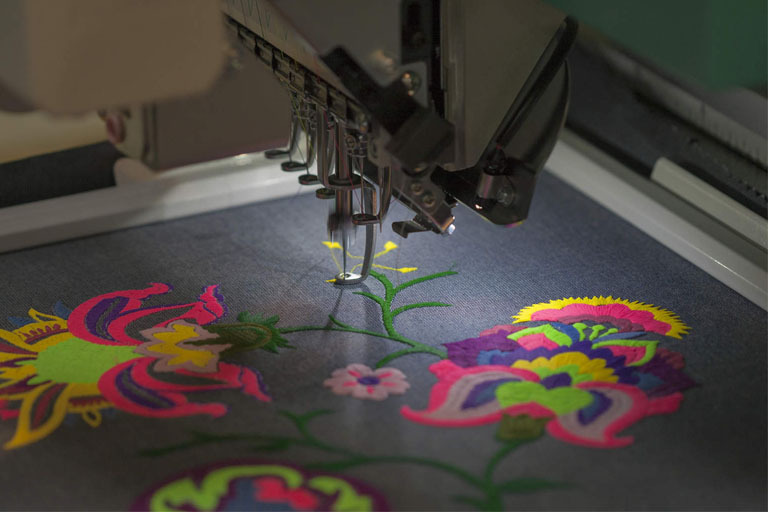 A commercial embroidery machine has multiple heads and multiple threads. Also, it's built to withstand the rigors of mass production and continuous use. If you're interested in machine embroidery as a craft, then a home embroidery machine will be fine. 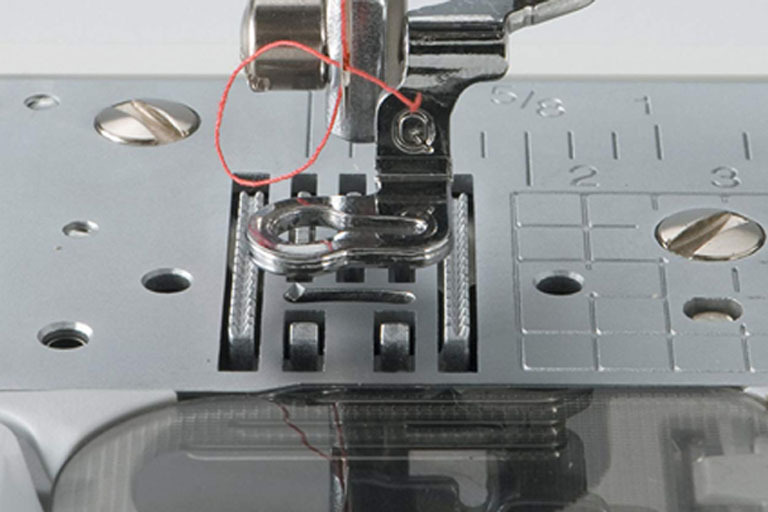 The throat width is the amount of space between the needle and the body of the sewing machine. A longer throat width gives you more room to move your project, as well as the ability to work on larger projects. In addition, a larger throat width will allow you to use larger embroidery hoops. 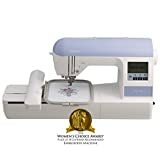 Is The Embroidery Unit Built In Or Separate? Some embroidery machines are actually sewing machines with a detachable embroidery unit. A lot of people like this type, because it allows the machine to do double duty as a sewing machine. Do you want a dedicated machine for embroidery only? Or do you prefer a machine that does both? What, And How Many, Hoop Sizes Does The Machine Allow? 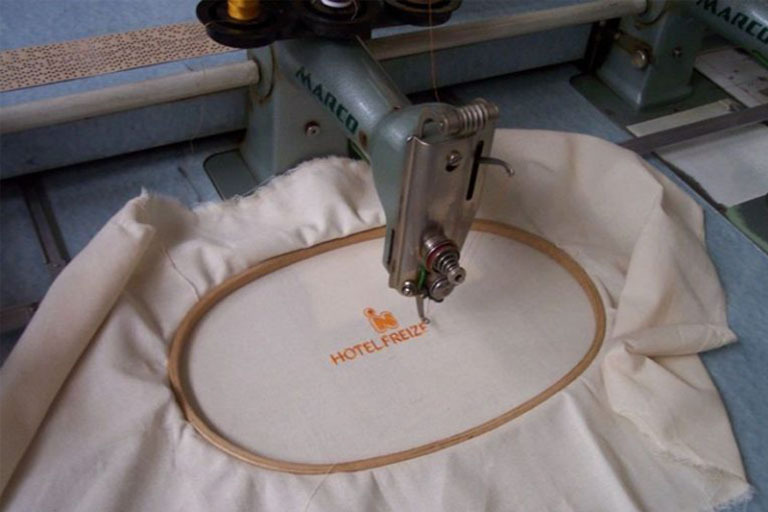 Just as with hand embroidery, you'll need to stretch your machine embroidery on an embroidery hoop. The more different sizes your embroidery machine can work with, the more different kinds of projects you'll be able to do. Are The Embroidery Designs Built-in Or Separate? Some embroidery machines have all their embroidery stitches and patterns built in. With others, users have the opportunity to upload additional stitches and patterns. Will built-in stitches be enough for you? Or will you one day want to add stitches and patterns of your own? What's more, if you do choose a machine with a library you can add to, what technology does it use for transferring the files? You can find numerous high-quality home embroidery machines for between $500 and $1,000. Commercial embroidery machines typically start around $1,000 and can cost up to ten times that, depending on the type you want. We consulted trusted sites like the Embroidery with Style, Sewing Machine Reviews, Stitchers Source, and others, to find their top picks for embroidery machines. Then we took to the internet to find out what real-life consumers who bought these models thought about them. After that, we made a shortlist. And then, finally, by combining professional and customer reviews, we came up with our winner: 2018's best embroidery machine. Hoop sizes: only one size: 4" by 4"
Reviewers praised this model's ease of use. They also liked its generous library of built-in patterns, designs, and fonts. Additionally, they were impressed by the jam-resistant bobbin and the LCD touch-screen display. In addition, they consider it good value for money. Unfortunately, there is only one hoop size, which some users may find limiting. A common complaint was with thread tension, nesting and tangling. Also, some customers remarked that it was difficult to obtain repairs when needed. Other reviews were pleased with the machine's versatility, customizability, and ease of use. On top of that, they felt that you get a lot of features for the price. All in all, 77 percent of nearly 2,500 Amazon purchasers gave this model five stars. Many found it easy to use, and a good machine for the money. Hoop sizes: up to 5" by 7"
Reviewers loved both the large, built-in pattern library and the machine's design editing function. They also liked the generous 5" by 7" embroidery field, which allows for both large and small designs. It is an embroidery-only machine, with no regular sewing function. Reviewers also noted that bobbin tension could cause issues with this model. 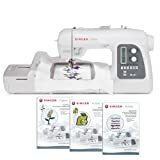 Both Stitchers Source and Embroidery with Style consider this model to be one of the best of 2018. The editing function and expandable design library gives limitless design options. Consumers loved these features, as well, with 69 percent of Amazon purchasers giving this model five stars. This machine was awarded a Consumer's Digest Best Buy award. Reviewers liked the generous pattern library and the expansive accessories bundle that comes with the machine, including 8 presser feet. They liked the intuitive LCD display and the ease of uploading new patterns. They also praised its stitch quality. Reviewers found the file format restrictive. In addition, they did not appreciate the lack of a thread cutter. Also, some said the hoop was flimsy, and hoop size was limiting. In short, 80 percent of Amazon purchasers gave this unit five stars. None gave it fewer than three. Critical reviews seemed to agree that the sewing function was better than the embroidery function. There are a lot of upsides to this machine. Reviewers were impressed with the versatility of this machine. In addition to a generous built-in pattern library, you can also easily upload and edit fonts and designs. You can also make your own. This machine will work with every major design file format, as well. In addition, it has a very generous workspace. It's expensive. Also, reviewers found this machine complicated to set up. In addition, they found a significant learning curve for mastering its functions. Customers also found issues with breaking needles and different kinds of thread problems. 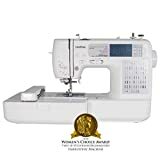 Reviewers found this to be a high quality, extraordinarily versatile sewing/embroidery combination machine. It may not be the best embroidery machine for beginners. However, for intermediate sewers, and those not afraid to stretch their abilities, this could be an amazing find. Half of all Amazon purchasers rated this unit with five stars. A significant number of critical reviews focussed on the steep learning curve. Where to begin? In addition to a generous workspace and expandable pattern library, reviewers liked the stitch speed -- up to 860 stitches per minute. You can also edit designs via the handy LCD touchscreen display, for virtually limitless design possibilities. There are 4 different hoop sizes, although you must purchase hoops separately. The price is the biggest complaint. Janome isn't known for bargain machines. 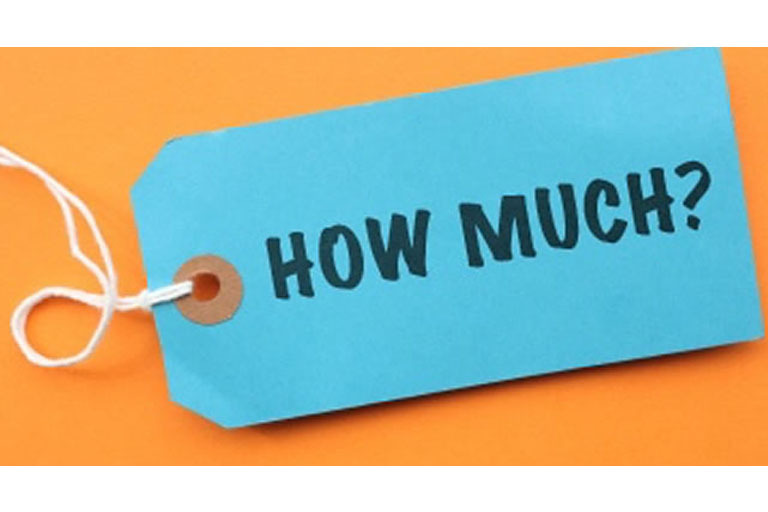 But reviewers and customers seem unanimous that if you're willing to accept the price tag, you'll get your money's worth. 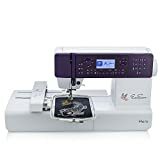 Some reviewers consider this model to be one of the best embroidery machines of 2018. They liked its generous embroidery hoop. In addition, they liked its large and easily expandable array of patterns. Hoop sizes: 6.7" by 7.9" and 5.5" by 5.5"
Reviewers praised this machine's versatility and ease of use. They found it to be a feature-rich embroidery machine that is user-friendly enough for people new to embroidery. The machine can handle Cyrillic fonts, as well as both vertical and horizontal writing. It also comes with an impressive accessory kit. However, the hefty price tag is a con for some people. ​This is very expensive for a home embroidery machine. However, it's simple enough for beginners. People planning on doing a lot of machine embroidery will find that this machine will stretch them and grow with them. 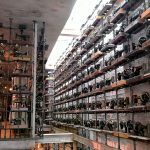 In addition, special technology prevents the bobbin and thread problems that sometimes occur with other machines. You can upload designs via a USB connection, and edit them right on the machine as well. It's a lot of machine for a lot of money. But if you can swallow the price tag, it may be all the embroidery machine you'll ever need. On top of this, no Amazon reviewer gave this machine less than four stars out of five. We are really partial to the Janome Memory Craft 9900. It is feature rich without being too complicated for someone new to embroidery. At the same time, is a lot of money for most people. If you're looking for a more inexpensive embroidery machine, we recommend the Singer Futurea XL-550. It's not a bargain basement machine, but at a little less than 1/3 of the price of the Janome, it's still a good deal.